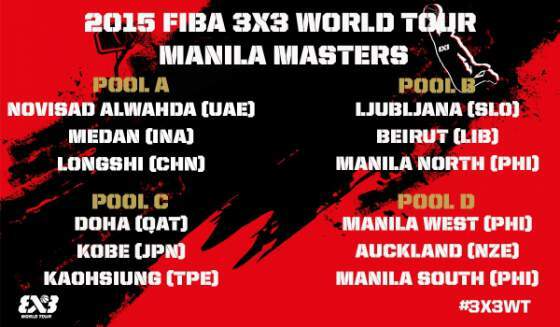 Philippine Teams in the 2015 FIBA 3x3 World Tour Manila Masters - Balita Boss! The Philippines will once again serve as the host of a FIBA 3×3 World Tour event to be held on August 1-2, 2015, which will give the Team Manila West a chance to defend the title right in front of their countrymen. The two-day event will be held at Robinsons Place Manila. Reigning champion Team Manila West is in Pool D along with Team Auckland from New Zealand and Team Manila South also from Philippines, the winner of the SBP-Talk 'N Text Under 18 Tatluhan national tournament. Manila West will once again be bannered by the number one 3x3 player in the Philippines, Terrence Romeo, and PBA players Aldrech Ramos, KG Canaleta, and Rey Guevarra, while Manila South will have Jair Igna, Carlo Ortega, Lucky Ecarma, and Joshua Sinclair. In Pool B, Team Manila North joined the 2013 FIBA 3x3 World Tour champion Team Ljubljana (formerly known as Brezovica) from Sloveni, and Team Beirut from Lebanon, who reached the quarter-finals of the Tokyo Masters in 2012 and Beijing Masters last season. Gilas Pilipinas cadet Jeth Troy Rosario will team-up with PBA players Calvin Abueva, Vic Manuel and Karl Dehesa for the Manila North squad. Pool A is composed of World Tour champion Team Novi Sad Al Wahda of United Arab Emirates, Medan from Indonesia and Chinese squad from Longshi, while Pool C has last year's Manila finalists Team Doha of Qatar, Team Kobe from Japan and Kaohsiung team from Chinese Taipei.